Here at Arrow, we try to keep the “fun” in functional, and that’s why we love pincushions that break the “tomato” mold! We’d like to encourage you to break out of the tomato mold and craft your own fun yet functional pincushion, so we’re pleased to announce the “No Tomatoes!” Pincushion contest and blog hop! Make a pincushion out of your child's art project, a vintage planter, or even a gelatin mold! Get creative! 1. Think outside the box and make a fun yet functional pincushion – remember tomatoes and traditional pincushions are a no-no, and it must be based on your original design. Yes, you can enter more than one pincushion. 2. Send a 900 x 600 pixel jpeg file of your pincushion to Rebecca@arrowcabinets.com by 5/13/11. You do not need to have a blog to participate in the contest. 3. 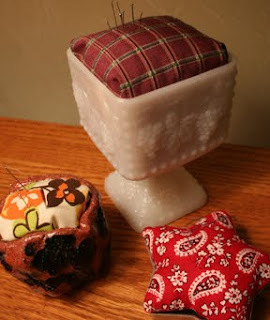 On 5/16/11, we will publish a slideshow here on the blog of all the pincushions. A panel of judges from Arrow will determine the winner , and the winner will be announced on 5/20/11. 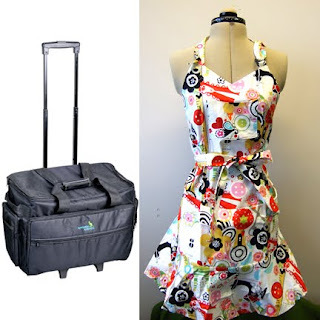 A Kangaroo Kabinets Rolling Tote and an adorable apron! 1. Email Rebecca@arrowcabinets.com with your blog URL by May 12th. You will then receive the outgoing link for the blog that will follow yours in the hop. 2. You will need to post an image of your pincushion on your blog and directions if you so choose, along with the outgoing link that you are assigned, by 10 pm on Sunday May 15th. Anyone that does not have their pincushion or link posted will be removed from the hop and will not be to be reinstated. 3. On Monday, the blog hop will be posted on the Arrow Cabinets blog along with the contest slideshow, and announced on their Facebook page. *International customers are welcome to participate, and you do not have to participate in the blog hop to enter the contest! Are we able to post more than one pincushion? What if i don't have a blog, can I still enter and how? Lacee, just email a photo of your entry to rebecca@arrowcabinets.com. Just wondering if that tote will hold a Janome 7700 Horizon. I have two that are two small ; ( The Horizon is huge...but I love it. Hi Thrifty, no unfortunately the tote won't fit the Horizon. Yes, just email us your pincushions! I can't wait to see all of the entries! yay. finally posted a blog about my entry. cant wait to see what yall created! pics sent, links posted on blog, saw a few pin cushions, all very very cute, makes mine seem kiddie! LOL cant wait for the slide show.